Energy costs are the fastest-rising expense for today’s data centers. Naturally, power consumption is a top concern for managers of data center, enterprise, and cloud environments. Moreover, there are multiple proprietary power measurement and control protocols supported by various solution providers, making it challenging to have a single solution for power management across all devices in the data center. After a successful Intel IT proof of concept (PoC) using Intel® Data Center Manager (Intel® DCM) that ended in 2013, we deployed the solution across data centers in multiple countries. 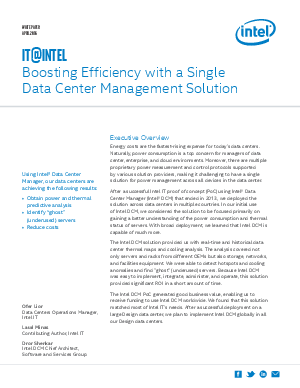 In our initial use of Intel Data Center Manager, we considered the solution to be focused primarily on gaining a better understanding of the power consumption and thermal status of servers. With broad deployment, we learned that Intel DCM is capable of much more. The Intel DCM PoC generated good business value, enabling us to receive funding to use Intel DCM worldwide. We found that this solution matched most of Intel IT’s needs. After a successful deployment on a large Design data center, we plan to implement Intel DCM globally in all our Design data centers.